Coming from Perth and staying in Maidenhead, where there aren’t a lot of hills, I was feeling a little under-prepared for this event. 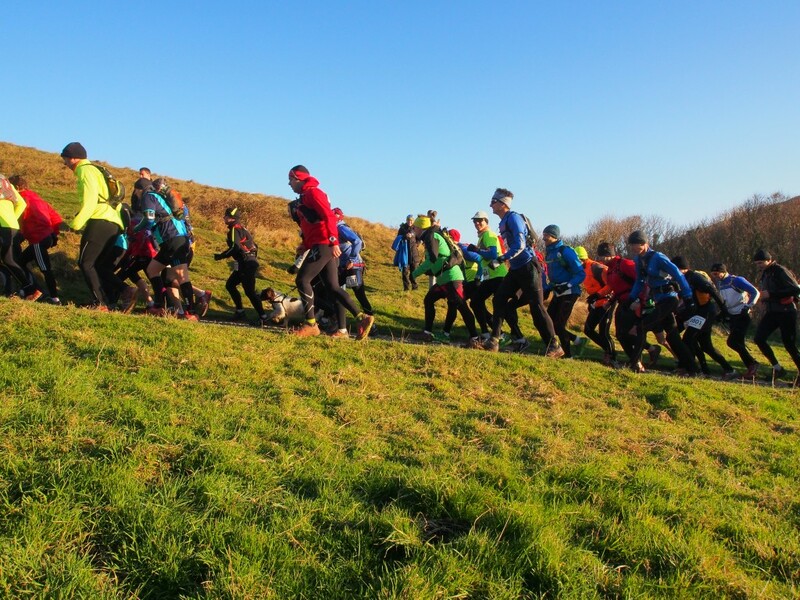 Just after I’d signed up for the event, Tony Smith described the course as “tough” which made me a little worried; when an uber-ultra dude says it’s a tough event, it makes you sit up and listen. I managed to locate a couple of hills near Maidenhead and employed these on my training sessions, but there’s only so many times you can run up and down a 75m hill in preparation for an event with +1500m elevation. We had spent the night at Longbarn House B&B where Anya had set out my breakfast requirements. 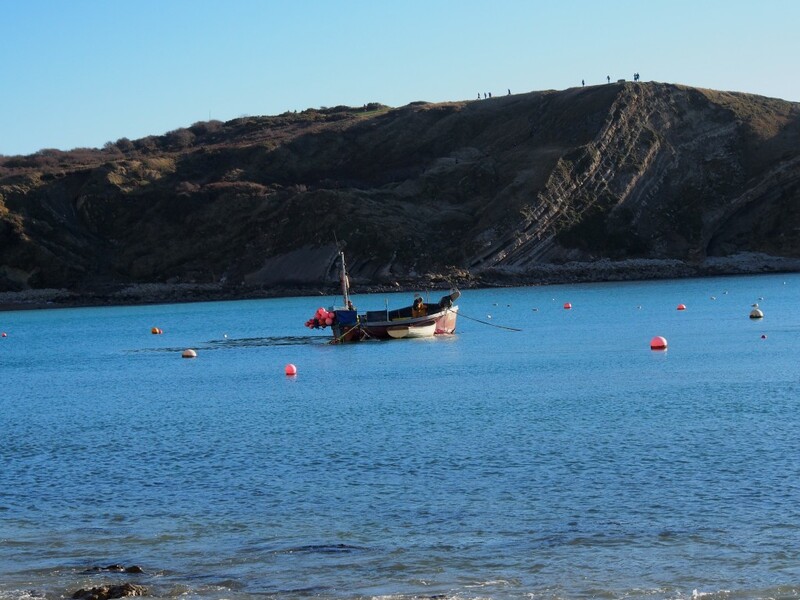 We drove the 20 or so minutes to Lulworth Cove where the race staging area had been set. There was a large parking facility (still had to pay though) and tents/marquees for race registration, race briefings, drop-bag zones etc. 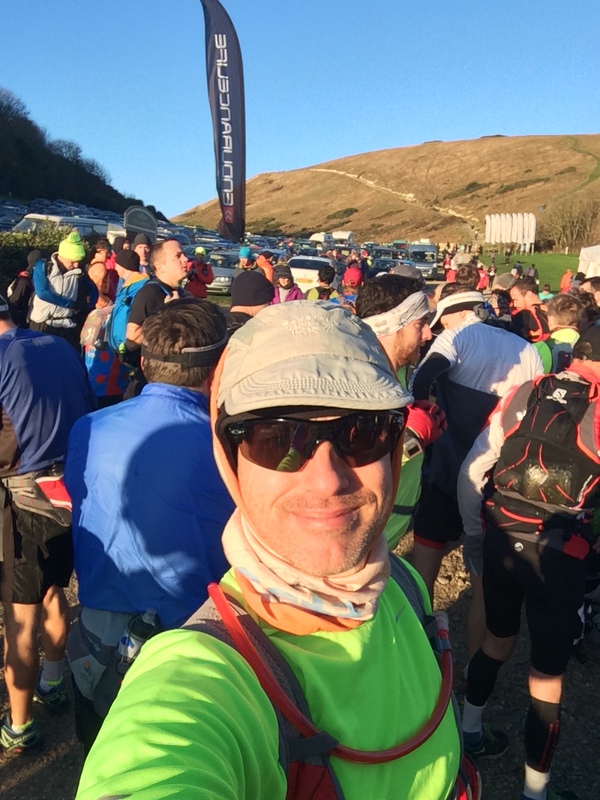 There were portaloos, a shop and a Clif sponsor marquee offering free bars and blocks. We were given a few minutes for a wee and to shed layers before our start. I decided to wear two long sleeved tech shirts and short sleeve shirt over these, I had on skins shorts and calf compression stockings under a pair of running long pants, a beanie and a cap with a buff around my neck but pulled over my head too, thick gloves and (of course) socks inside Altra Lone Peak 2.0 shoes. A guy next to me was talking to another lady and said, “All you need is one layer!” I had three layers on my torso and two layers on my legs. (Later in the day, I’d get colder, again.) Later, I’d find out the thermometer temperature was -1C and the “real feel” temperature was -6C. I’d had a brief introduction to Tailwind Nutrition when I was in Australia, and struggling to find a suitable local alternative for a fuel source in the UK, I’d ordered some more from the US. I’d done a few runs with it and it performed exactly like advertised. In my hydration pack, I had 600 calories worth of fuel in 1.5L of water. For contingency purposes, I also had a handful of gels and some energy bars. The day before and in the morning of the event, I’d been consuming electrolytes from H2ProHydrate but I didn’t take any with me; a mistake? As I stood in the start corral, I looked at the assortment of different shoes; there were some seriously-lugged trail shoes (mainly on the serious looking runners) through to some very ordinary looking road shoes (on some of the less-serious looking runners). This was going to be the first real outing for the Lone Peaks so I was hoping I had made the right decision; but really I had no other choice as they’re the only trail shoe I own which don’t tear my feet up after 5km. Someone started the countdown, then we were off! Like the ultra-runners who started an hour before us, the uber-marathoners ran from the start and disappeared up the first hill. The rest of us started with a jog or a shuffle, which became walking as we encountered the first incline. I’d run Six Inch in 2013 with Dan Baldwin and we paced each other, or more correctly, we restrained each other from going too hard too soon, but this was different as I was completely on my own in a crowd of 200 or so other runners, and I had no idea how to pace myself when I knew the course was designed by a mountain goat with a grudge! I was hoping just to finish this tough event, but had set myself a time-goal of 6:30:00 with which I’d be happy, so the average pace required was about 8:50/km; I’d be ecstatic if I finished sub-6hours with an average pace of 8:11/km. At 5km my average pace was 8:13/km. We’d been up two “moderate” climbs (I thought they were actually quite tough, but tough was waiting in the second half, so these turned out to be some of the easiest climbs of the day!) and I was behind schedule. I was cold, but warming up; I had taken off my gloves. 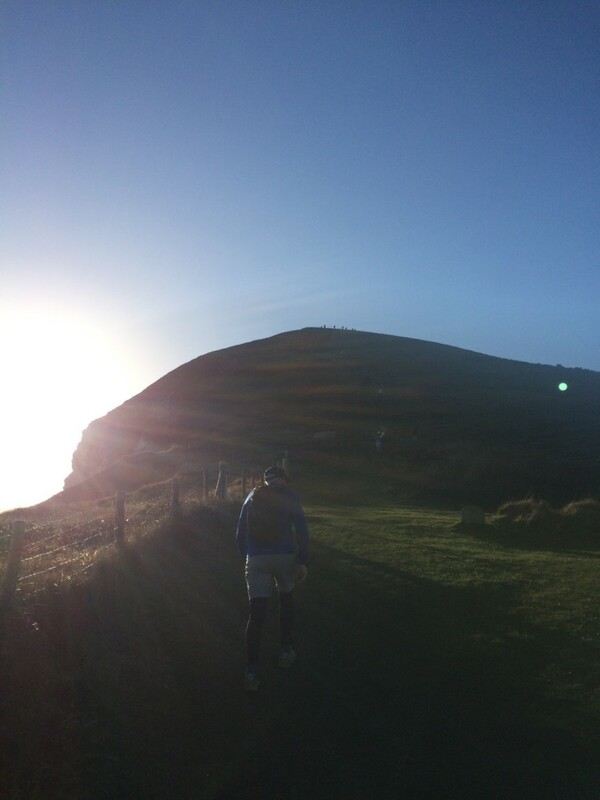 The course saw us run along the coastal cliffs; it was beautiful scenery. I took my phone out of the pack and tried to take a couple of photos as I ran, but I couldn’t get the camera to work. I had put it down to the fact that it was too cold and the iPhone just didn’t like playing in this sort of weather. I was too busy trying not fall off the cliffs and to pick up the pace to bother playing too much with the phone, so just stuffed it back into the pack. (Later, I’d realise the phone had just turned itself off, or been bumped off whilst jostling in its pocket). By the time we hit 8km where we turned inland, I was running with a Londoner. We chatted about our preparations and both complained that we were ill-prepared for the hills. It made me feel a little better that I wasn’t the only person out on the course who didn’t have ready access to hills for training. He giggled when I told him how many layers I was wearing as he was just wearing two shirts and a pair of shorts. By this stage I was warm enough to pull down the buff from my head and even removed the beanie so I only had my cap covering my head. In the process of stuffing my gloves and beanie into my pack, I accidentally stopped my Garmin which I didn’t notice for three minutes or so, not long enough to be of any serious concern, but long enough to niggle on my mind as we headed uphill, inland to the first checkpoint. As we turned away from the coast, the Londoner and I passed two guys, one of whom had a very familiar accent to me, he was from Melbourne. He was running with his English mate and they were chatting about F1 drivers as we all toddled up the hills. The course was very well marked, it took only a moment after taking one turn to notice we didn’t have a flag marker in front of us, so we turned around and went back to the right path, losing no more than 30m in the process. I timed in at the 10km checkpoint, my watch said 1:11 and the official time was 1:14, an average pace of 7:24/km or so since the start, which meant we flew through the final few miles before the checkpoint! This was to have consequences. After the checkpoint, we stepped out onto the only road section. It was uphill, of course, and there were small patches of “black ice” on the road. Up ahead, I saw people weaving around but didn’t know what they were trying to avoid until I trod into one of the patches and nearly fell. The road wasn’t closed to traffic, but the two cars which did come passed were very courteous. Soon enough, we were back into fields and trail, running along the side of a hill. It was at this point I started to cramp, particularly in my left leg which was on the uphill side. 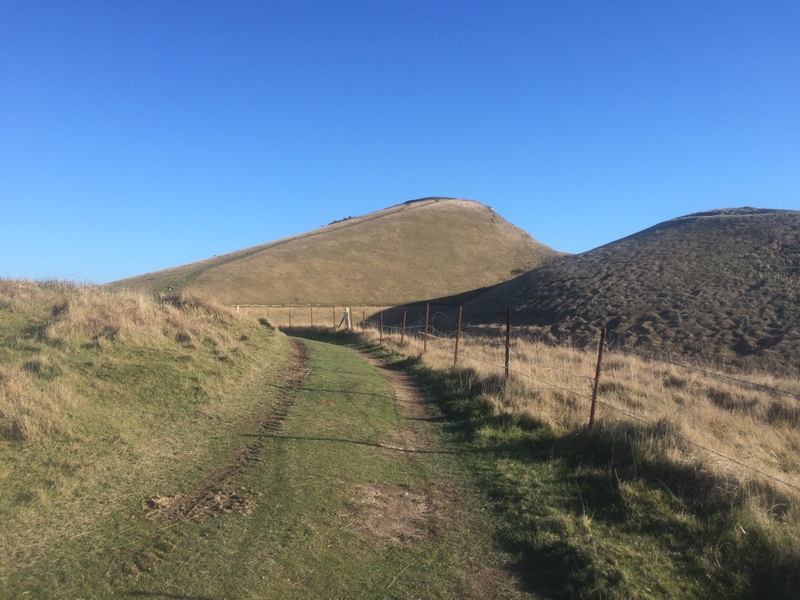 I blamed the slope to start with, but shortly after cresting the hill my right leg started to complain too; it wasn’t the hill, it was my dreaded foe, described by Dr Tim Noakes as “early onset muscle fatigue” caused by going out too hard too soon. I had left the Londoner, the Aussie and his mate at the checkpoint and had caught up to a group of six or seven, I tagged on to them end was running at their pace instead of my own. I stopped for a few seconds and let them open a gap in front of me and then resumed running at my own pace again, I ended up overtaking them before we got back to the start/finish area. 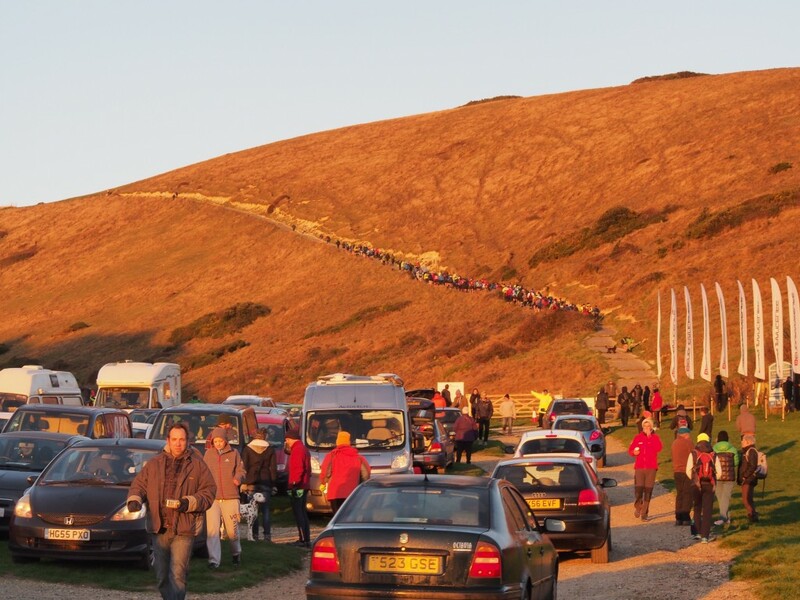 As we approached the start/finish area, we could look down from the top of the hill and see the marquees and carpark. I had told Tracy I’d be back through in about 2:40-3:00. As I descended I looked at the carpark to spot our car where I was going to refuel; I had spotted the white van parked near our black wagon with a small motorhome just behind us, I’d lose no time as I knew where I was going… until I got to the bottom of the hill and Tracy called me to her. I’d spotted the right pattern of vehicles in the carpark, but it just wasn’t our car! I arrived at the “halfway” point in about 2:10! I was soooo far ahead of schedule, but I knew the toughest parts of the course lay ahead. Refuelled and repacked, ready to get on with the “serious” half of the event. We headed out of the start/finish area, through the village to find ourselves on what the locals call a “beach.” The pebbles and rocks are predominately smooth, but they have a tendency to shift when you step on them and your feet sink into them. I punctured the instep side of my left shoe, bugger. There were water crossings along the beach and with more than 20km left to go, I really didn’t feel like getting my feet saturated with ice-cold stream water, so enabled “princess-mode” and kept mostly dry. At the end of the beach was a clamber up a cliff, helped by some “steps” which were lumps of concrete placed at strategically wrong places; you could tell they were in the wrong places because you could see where people actually went up the hill through the grass and mud near to where the steps were. This became a valuable lesson later: don’t always assume the steps are the easiest or fastest way to ascend/descend a steep slope; often the well worn path next to the steps is the better option. The area of the course is a UK Ministry of Defence tank and artillery firing range. There are loads of signs saying so, and not to stray off the path for risk of death. As the path took you along the coastal cliffs, other signs kept mentioning not to stray off the path for risk of death from crumbling cliffs and hidden edges. This was no place to let the mind wander, you had to remain very focussed on where you were and where you were going. I was concentrating hard during one section, a little uphill, through a gate, then downhill again; it wasn’t until I saw the bloke in front of me suddenly stop that I looked up and saw what was to the be the first truly “you-cannot-be-serious” climb. Even though I had tried to operate the camera earlier, I just had to find what was wrong and get a photo of this hill! The hill rose just over 100m which in itself is not too bad, but it was steep, averaging over 20% incline with sections over 30% Now I was regretting not having hills to train on and cursed Tony’s “lumpy” description as the understatement of the century! But as soon as you got to the top, you had just as steep a descent on the other side. I gingerly picked my way down the “steps” and occasionally ventured onto the worn path next to the steps. 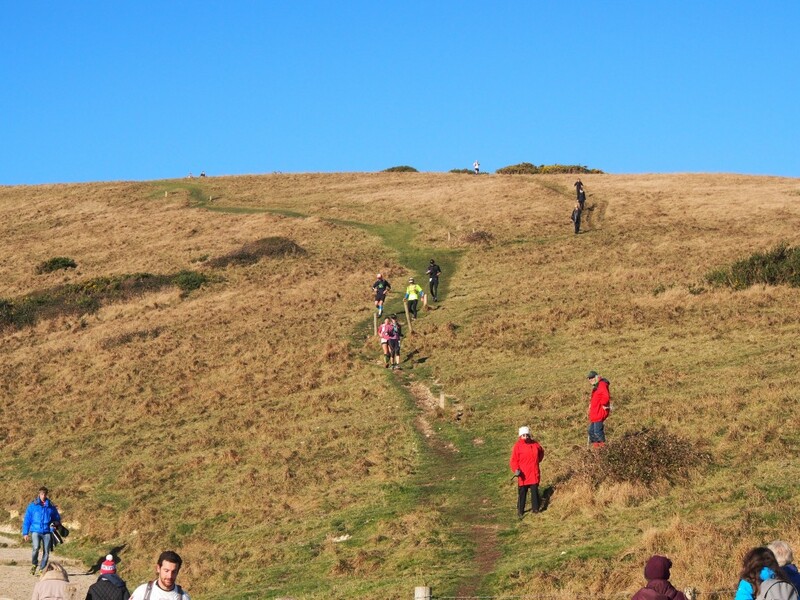 Some very experienced (and very brave runners) flew past me on the downhill; their legs were just a blur of motion as they took tiny steps in very rapid succession and bounced over the uneven surface. I marvelled at how they managed to get down the hill so fast and desperately wanted to give it a go too, but one slip and your day (and maybe your life) would be over, so common-sense took over and I continued to pick my way down, trying to protect and save my cramping quads and calves as best I could. Just as we got to the bottom of that behemoth, the next one came into view! Just as big and just as steep, but this time the path was smooth, short grass. There were no steps. 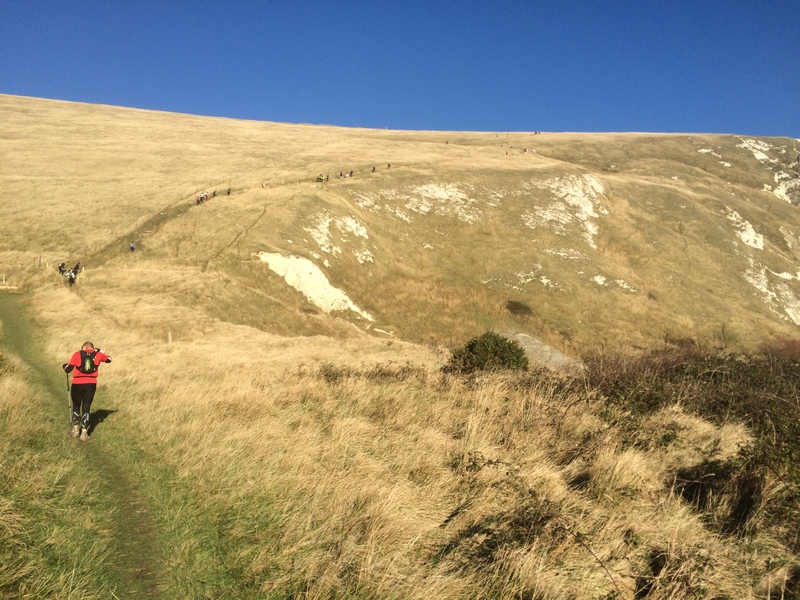 As I started my trudge up the hill, I passed others in just as much pain as I was, and we were passed by others who were in considerably less pain than us. At one point I looked up towards the summit (not a wise move!) 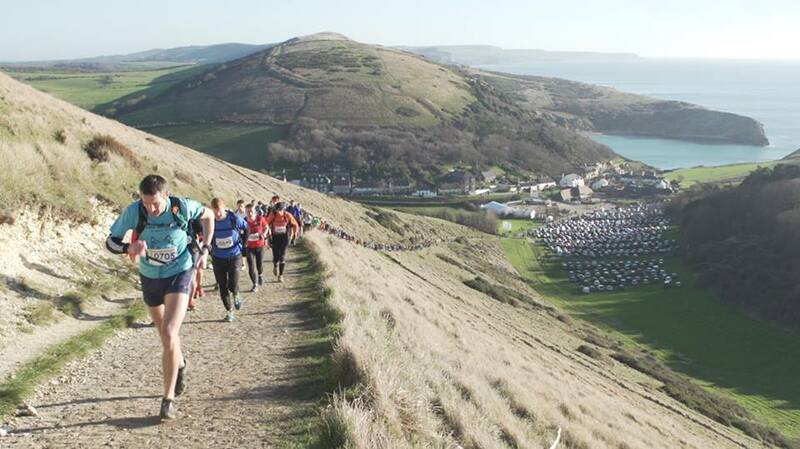 to see some of the ultra-runners coming back down the hill. They had started an hour ahead of us, but were running twice the distance, so these guys were flying! Inspired, my pains subsided a little and I picked up my pace. We did another cracking descent, followed by another brutal ascent, and the obligatory brutal descent. We ran along the coastal cliffs through some awesome scenery, but again you really had to be concentrating on what you were doing rather than looking around. I was having trouble managing all the little things which were starting to get on my nerves; my cramps were getting worse, the water in my pack was “warm” from being against my back but the water which I’d actually consume was in the hose and it was freezing cold and hurt my teeth when I drank so I’d have to slurp and spit the cold water first until the relatively warm fluid arrived. Worst of all, as we passed the “nodding donkey” oil pump and ran along a vehicle track, I started singing to myself, “I Was Only 19 (A walk in the Light Green)” by Redgum, an earworm that would bug me for miles and miles! Just after the oil pump, we turned away from the coast. 30km done in about 3:45 an average pace of 7:30/km I was feeling OK and I was still well ahead of schedule, despite the three monster climbs and one beach run since the “halfway” point. We headed across a farmer’s fields; it had been mentioned during the pre-race briefing that we were to stick to the signed path and not to deviate as the farmer was allowing us to pass through his cropped fields. It didn’t really sink in until I arrived in a massive field of cabbages that the farmer was allowing us to trample a section of his income. Thinking about this didn’t kill the earworm, but it quieten it down for a brief moment. At the end of the fields was another climb, but by this stage if I had run for more than a few metres then I knew the next climb must be close! This very eastern end of the course was a loop, so after running inland for a bit, then parallel to the coast for a bit, it was time to briefly rejoin the coastal trail which we’d already run. 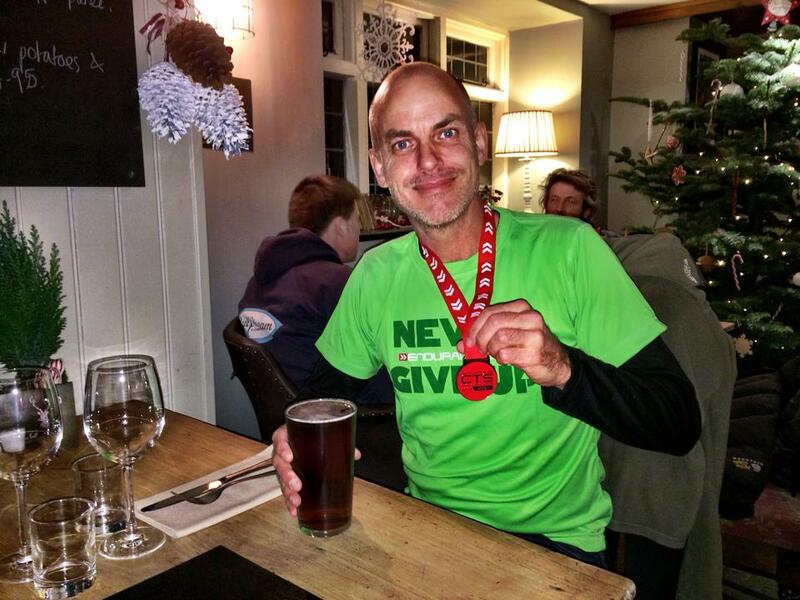 It was nice to see other runners still heading towards me; I felt sorry for some of them because I knew what they were in for in the miles ahead as I’d just been there, but they were plodding along blissfully unaware (just as I had done and as how I must have looked to the runners who saw me earlier). I was beginning to pass a lot more people now, but a lot of people were also passing me. A lot of the people I was passing were the ultras and the people passing me were the marathoners, I think? 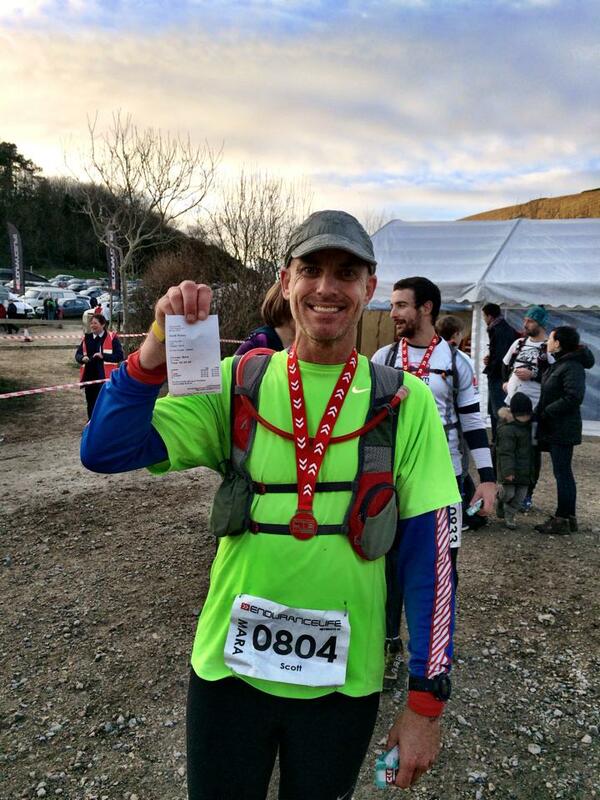 Everyone had white bibs with your event printed next to the race number and your name printed underneath the number. Earlier, in a brain fuddled daze, I was wondering why there were so many runners named Mark in this event, then I realised I was reading the bibs wrong and I was reading “MARA” for marathon, the same event I was in. A few kilometres later, things would get even more confused when the ultra and marathon courses would join up with the half-marathon course which had split off earlier. Now there were three groups all heading in the same direction but were in three separate events. I’d like to think the marathoners gave the ultras as much room and cheers as they needed as they came through, but unfortunately some of the half-marathoners were not so considerate to me or some of the other runners passing them, whatever event they were in. The half-marathoners weren’t at the halfway point yet, but many weaved all over the course or moved in un-passable clumps. Around the 35km mark, we went through a “ghost-town” called Tyneham. The town had an interesting history as it was forcibly evacuated during WWII as D-Day staging exercises were planned nearby and the MoD didn’t want any uninvited observers. Although the war is long over, the town was never re-populated and stands today pretty much as it was left all those years ago (as a National Trust site, and in need of a little TLC here and there!) A few groups of bemused tourists looked on as we plodded through the town; some called you by name, but, they also called a lot of people “Mark” too from what I could hear. We climbed to the second checkpoint at 36km, I checked in with a time of 4:43:50, average pace 7:53/km since the start. I was slowing down. The cramps were nearly continuous now and the “dark times” were becoming more frequent. I was running predominately alone, but a group of ultras passed me and then I’d pass them again; we did this for a while and had a brief chat each time, which buoyed my spirits each time. It was about this stage when I decided that running these sorts of events is not so much about the training beforehand, but about management on the day. Sure, training helps you be better prepared and therefore more manageable, but nothing can really prepare you for the day, you just have to manage as best you can, everything which comes your way. Management, by example. At one point in the second half, a fly landed “on my glasses” and was a blob in my vision. I swished my hand in front of my face but the insect didn’t move. I went to remove my glasses only to discover I had already taken them off and left them in the car at the halfway refuelling; the bug was in fact in my eye and stuck to my eyeball! No amount of training can prepare you for trying to shoot yourself in the eye with your hydration pack hose whilst still running and not stumbling or running off a cliff! A bit after the checkpoint, we ended up back at the coast to head back along the path we’d already run on the way out. We had to run up the back of the second big hill after the halfway point, and down the side we’d already run up, and then run up the back of the first big hill after the halfway point, onto the ridge line which we’d follow back to the beach. My quads and calves were complaining continuously. The sun was starting to get lower in the sky (it was now after lunchtime after all!) and the wind was chilly; I was regretting leaving my gloves and beanie at the car. Happiness, being misery shared, I wasn’t alone as many others were in just as bad a condition as I was, or worse! I could still manage a trot but they could only walk, and some of them could only barely walk and it was still 4km to the finish. The hills were soul destroying for them. Heading up what we’d already come down. At some point along the ridge, we passed a sign, “One Mile to Go!” This must have been the longest 1609m of my life! Between that sign and the finish, we had to go up a small ascent, down a steep set of steps, a beach run and then up a small incline to the finish line. During the ascent, I was putting on a sprint as the track was pretty good, I was running hard and looked at my watch to see I was making a pace of 6:45/km! That was as fast as I could move. We made the steep descent off the ridge and down the steps to the beach. At the foot of the steps was a narrow “jetty” with a few more steps at the end. I remember thinking to myself, “Do not fall off, do not fall off!” but the longer I spent on the structure the more likely it would be that I’d stumble or tumble so tried to move swiftly as I could, which was snail’s pace! 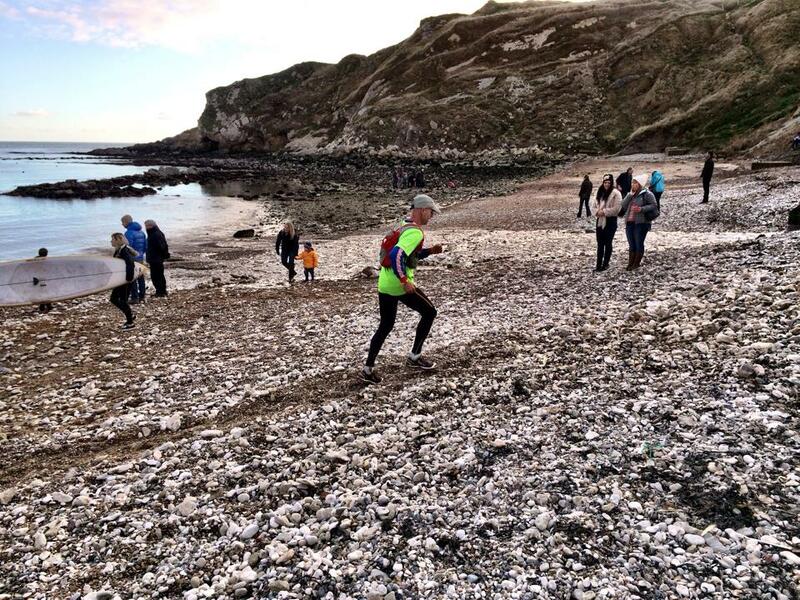 I made it onto the “beach” and headed in the footsteps of the runners who’d gone before me. The rocks weren’t any better the second time around, but being so close to the finish I didn’t worry about getting wet feet; in fact the cold water was quite soothing. Tracy was waiting at the end of the beach, as were a number of spectators. Since we were last here, a fishing boat had arrived on the shore and blocked the access to the ramp I used to come onto the beach hours earlier. It doesn’t sound like much, but such a simple obstacle can be quite a challenge to figure out when you’re fatigued. Eventually, I decided to take the steps off the beach instead of running around the small fishing boat or chancing fate by trying to step over a mooring line. Final few metres of beach. Keep going! Running back through the village, there were a lot more people around now; the 10km runners had finished their event as had some of the faster longer distance runners. Still, some people failed to respect runners still finishing and wandered to-and-fro across the road in the path of oncoming, fatigued and frazzled runners. I ran the final few metres with an ultra-runner who decided he’d bitten off way more than he could chew and was withdrawing from his event and would collect a time for the marathon distance instead. We crossed the line, me in 5:45:46 with an average pace 7:57/km and him in an hour more. I was nearly 45 minutes ahead of my “happy” time and nearly 15 minutes ahead of my “ecstatic” time! I was cold. I was sore. I was wet. I finished. I was happy. Tracy got me to the car and we headed back to Longbarn for a loooong hot shower, then hobbled around the corner to the pub for a traditional finish. Pacing. Still have to get the pacing right to prevent early onset muscle fatigue (cramps). Hydration. Even in the cold it’s important to keep drinking. I cut back in the second half and I think it was detrimental. Manage the small things. Don’t let small problems become big problems. Focus. There are only a few times during such an event can you let your mind wander from the task at hand. Exploit those times, they’re few and far between. Sunday (the next day). Walking down stairs was difficult as my calves and quads were destroyed from all the hills work. I had a sore right foot, on the top, just at the ankle, which was probably caused when running downhill. I was starting to get a cold during the week and by Sunday night I was coughing and spluttering; Tracy wasn’t happy. Monday. Still sore but am able to walk up and down stairs. Got a physio massage, ouch! Cough is still annoying; Tracy is still not happy. I can walk, but need to get running again.